This month our rider interview comes from Neil Brierley, Head of Operations for Wales & South West at Faithful & Gould. Neil has now completed two of our Cyclone24 challenges, along with being signed up for 2 more, so he’s an old hand (we’re hopeful the word old won’t upset him) at the challenge and can certainly tell you a thing or two about taking part! We received a flyer to the office advertising Cyclone24 in Newport, and it seemed to offer something very different from the normal team-building events that we have taken part in. 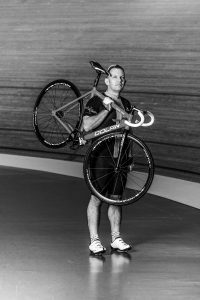 The chance to cycle on the hallowed boards of the Newport Velodrome, following in the tyre marks of Cavendish, Wiggins et al was truly appealing to me as a keen cyclist and to a number of my team. In addition, the opportunity to meet other teams from across the business community and make new friends and contacts was really appealing. Our team attended a number of the excellent introductory sessions delivered by the Velodrome on behalf of Cyclone24. We also did some road cycling, however with hindsight a bit more conditioning training of certain parts of one’s anatomy would have been of benefit. The most amazing thing for me was the tremendous spirit, humour and camaraderie displayed by all the teams. Everyone was really friendly, chatty, and focussed on having a great time. I have made so many great friends through Cyclone24. You’ve taken part in both the Manchester & Newport challenges, Home of Team GB and Welsh Cycling. Did that serve as inspiration and did you ever pretend you were Bradley Wiggins whilst cycling? The chance to ride at the home of British Cycling in Manchester and at the home of the pre-London Olympics training camp was truly inspiring. My thoughts did at timed drift to imagining I was a somewhat more superhuman track cyclist than I actually am, but they normally came back to the present fairly quickly as my legs started “shouting” at me. The emotions in Newport and Manchester were very different. Newport 2016 was my first Cyclone24, I was an inexperienced track cyclist, and was thus very emotional in terms of the sheer achievement of completing the event. Manchester in May this year was actually more enjoyable and I actually felt a bit disappointed that it was drawing to a close – I enjoyed it immensely, mainly due to being considerably fitter now and also more skilled having completed my British Cycling Track Accreditation. What would your advice be to somebody thinking of doing the challenge for the first time? Don’t think about it, just do it!!!!! Why do you want to take part in Cyclone24 again this October? For a variety of reasons, but mainly due to it being a fantastically organised event, at a really friendly venue, and also because I am a velodrome-nut and can’t get enough of turning left at 42° !!!! Neil and the Faithful & Gould team have now signed up to Newport in October this year and Derby in February 2018. 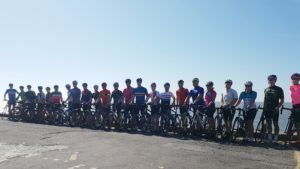 They are also using Cyclone24 as part of their company wide initiative to celebrate their 70th anniversary which sees Faithful & Gould employees taking part in 70 4 Seventy, a charitable campaign to raise £70,000 for the Alzheimer’s Society by cycling 7,000 miles over 70 days. You can read more about their fundraising efforts here.